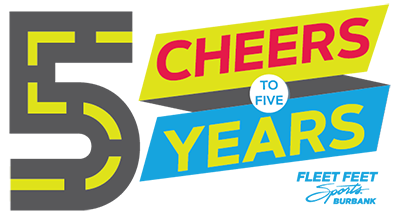 Fleet Feet Sports Burbank is turning 5—help us celebrate! Keeping with tradition, we're hosting a free group run to 5 important FFSB landmarks in honor of our 5 year anniversary in October. With Saucony sponsoring the birthday extravaganza, awesome giveaways and prizes are a guarantee. All ages and abilities welcome. Please come run, cheers, and party with us! Of course, one of the locations is the store: the first 50 people to arrive can customize their own free Saucony "Run Your World" t-shirt. The remaining 3 run destinations are Brewyard Beer Company, Verdugo West Brewing, and our Pub Run staple, Tony's Darts Away. 8:30 PM // Return to Gordon Biersch for the chance to win raffle prizes because you will want to win them. How do Saucony running shoes and a Saucony prize package sound? The party doesn't have to end here, though. Feel free to stay for more merriment with the run fam! Five years! A milestone number and one we couldn’t have reached without each of you and your support along the way. These last five years have taught me so much, but more than the lessons learned, they have shown me a run community that comes together and around each other. From me to you, thank you all for being part of this community with me, participating in and supporting it, and helping to build a better one. You have helped make us who we are and I couldn’t be more grateful! I can’t wait to see what the next five years hold for us! REGISTER NOW // Stay up to date with event details!